Meet our new guest author, Ian Huitson, or Hui. Hui will share excel tutorials, implementations with us once a week. Please visit About – Hui to learn more about him. 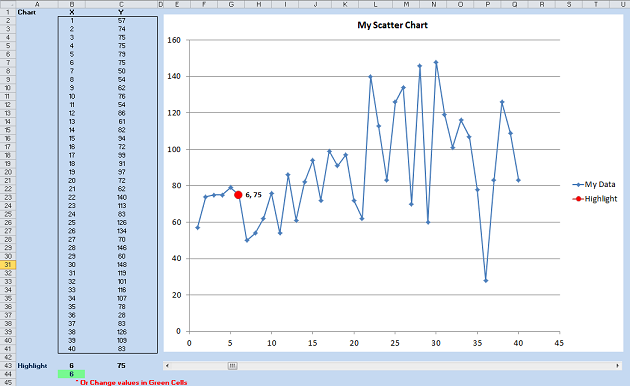 This week I am going to introduce a method for allowing single points to be highlighted and interactively moved in Excel Scatter / X-Y Charts and Line Charts. Excel charting basically has 2 styles of charts with these being Y value vs X Value charts and Y value vs X Label charts. Examples of the X Value charts are Scatter and Bubble charts. Examples of the X Label charts are Line, Column, Surface, Area, Radar and Bar charts. The basic differences between these is that the former has a variable X Axis and the later has a fixed X-Axis spacing between subsequent data points. As these charts are plotting Y vs X directly onto the chart, it is simple to add a series which contains the points you want to highlight. 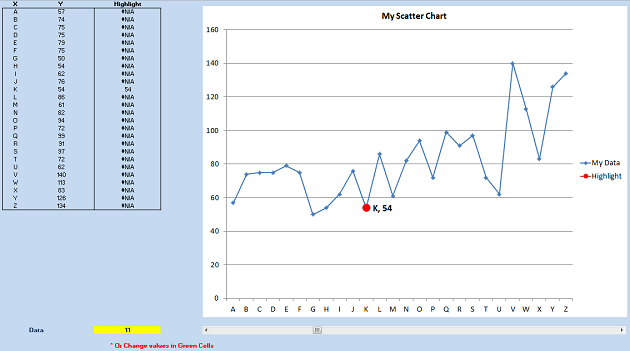 It is worth noting that chart series for Scatter Charts don’t have to have an equal number of entries in each series. We will use this add a new series with just one point. My Data is an X-Y set of data in B2:C41, each Y value in Column C is plotted on the chart against the corresponding X value. Note that both these formula retrieve a value that is the value in the Cell Reference cell, B44, below B1 and C1 respectively. As you move the slider the Highlighted point will move back and forwards across the screen and show both the location and X & Y Values of the data point. The coordinates for the new point are retrieved from the My Data list by using an offset from the top of the list. 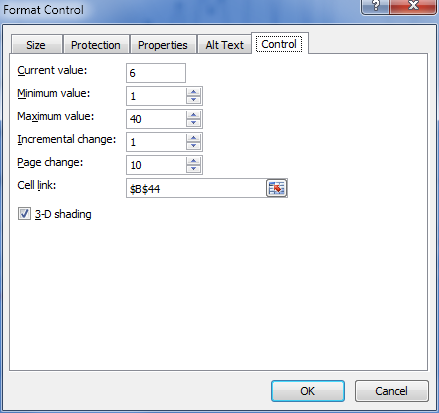 The offset retrieves its offset value from a Cell Reference cell which in turn is controlled by a slider. Why use Offset instead of Vlookup or Index/Match? We aren’t concerned with looking up the actual value of the highlighted point, we are interested in retrieving for example the 9th data point from the list and the the 10th or 8th as we move the slider. The Offset only cares about how far it has to go to get the value, not the value. By doing this we can mix up the X values, as Scatter charts allow you to do, and offset will happily retrieve data in order and doesn’t care about duplicates or having sorted data. 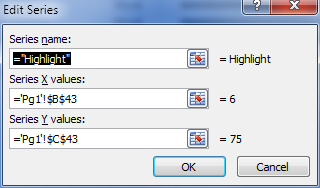 Type any values into the X Column and watch as the offset happily maintains the highlighted point. As these charts are plotting Y vs the position of the value on the X-Axis, a slightly different method is employed to highlight a point of interest. For Line Charts we will add a new series to the chart and then use a method for hiding the non-highlighted points so that only the highlighted point is visible. Copy D2 down to D27, Don’t worry about the errors #N/A, you put them there. The coordinates for the new point are retrieved from the My Data list by comparing the current Row to the Cell Reference cells value and if they are the same retrieving the Y value, all others rows have an error message inserted. 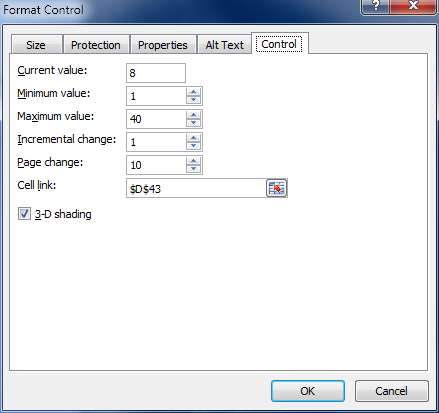 The slider is connected to the Cell Reference cell and so when the slider is moved the Cell reference cell updates and the new highlighted cell retries its value. You can add multiple highlights using the same techniques described in this post ie: for showing Min and Max values. It might make more sense to call the two chart classes "X Value" and "X Label" classes, since both have X axes. Surface, Area, and Radar charts should be included in the X Label class, not the X Value class. Some members of the X Label class can display a value-type X axis when the X entries are dates: the X values are plotted proportionally to the dates they represent. These types include Line, Area, Column, and Bar. I have updated the post to reflect you comments. Excellent post; I had tried without sucess to highlight a point. For your interest the point I want to automatically highlight is the MAX, so I can modify your formula (remove the slider, etc) to do that. Thanks! This setup is fine for XY charts if you have one point to highlight. But the approach used for the Line chart is more flexible. Suppose you are highlighting the maximum value: if you write a formula to show a value if it matches the maximum, and #N/A if it doesn't, then you can accommodate multiple points that meet the criterion. This is the approach I took when I wrote about conditional charts (http://peltiertech.com/Excel/Charts/ConditionalChart1.html). Your ability to highlight different points is limited by your ability to capture criteria in the formulas you write. I know this is not what you expected, since it is not a scatter or Line Chart , however the topic is highlighting and considering next week scheduling is the main topic, I hope you find this file interesting. Highlighting is made with two different technics, conditional formating to highlight activities (plain text, horizontal), and 2nd-series bar chart for date highlight (vertical). Great post - How would you change the code to highlight a point and then move it to another series so that you could remove it from a regression ? This would be most useful in removing outliers. This other series would still be visible but plotted with different symbol parameters. Another interactive way is to set up a number of Highlight series for each chart series as described in the Line Chart section above. Change the formula so that a point is highhlighted by 2 criteria, The First is as described above and the second a Radio Button which you could use to select the series to highlight. Interesting, I'm new in this kind of things. I don't know how to change the formula to do the radio button, could you explain it?? I tried with if, but I only can put one if statement. One more question, How can I do it for XY data?? If this doesn't help please clarify your request? Here a question from the Netherlands. I like this post very much, but in my case the chart is a pivotchart. Is this also possible for a pivotchart? If yes, how? If no, is there an other solution to my problem? I have a pivotchart that shows the price of a product during a year. I want to show the value of the most recent billed price. The chart updates every week, so the most recent billed price is every week a new 'dot' in the chart. My offset is returning 0 instead of value in cell. Why? Another problem besides the one above is that the new data series doesn't show up on chart so I can't get to its editable features. Perhaps when the prior problem is fixed maybe this will simultaneously be as well? Also need to know where to find slider within Excel. The slider in my workbook was copy/pasted from the sample file above. Is there a way to get it to use the selected cell in the source table rather than a slider? Thank you for all the great tips, chandoo and Hui. I've more or less gotten the hang of the techniques discussed in this post and have been able to apply them to situations that are more or less similar to the examples given. But when I tried to extend it to something I'm working on right now, I've been hitting a brick wall. I have an XY table with text identifiers for each XY pair (based on which the table is sorted). COUNTER being the cell that the slider links to. My problem is I can't figure out how to relate the COUNTER to k and retrieve the next corresponding Y value when I scroll the slider to the next duplicate instance of X. Is this doable? Or is my only option resorting the original table according to X values? Thank you for your reply, Hui. I highlighted in yellow the formula I was having trouble with. Basically assigned RANK values to each data point with X as major criteria and Y as minor, then uses the COUNTER from the slider to scroll through the data points in order based on the RANK. Feels rather roundabout to me, but it works. If anyone can offer a cleaner solution I'll be much obliged. Credits to Mr Girvin and D Dalgleish for their great RANK tutorials. also, could it be possible to do this with stacked bars/columns without using VBA? After couple days of working on it, I finally made the line work!! I didn't use the OFFSET formula, but rather the IF formula in a separate row than my original numbers. My issue for not getting it to work right away was not paying attention to all the parentheses!! This is great stuff. Thank you. It really helped me highlight scatter-plot data in sequence. It's a real sharp addition to charting. I was successful in plotting a highlighted duplicate point as a Series2, however my "highlighted point" won't show up with Series1 on top. I made sure that the highlighted point is much larger that the Series1 points but it still doesn't show. As soon as I click on Series1 data in the graph and delete it, my Series2 highlighted point suddenly appears where it should be. It is as if excel is suppressing my "Highlight" point because it has identical coordinates as the Series1 data. Answered my own question just now. For anyone troubleshooting why their highlighted point series doesn't show up, make sure it is plotting on the same axis (either primary or secondary) as your source data.